This is definitely a dish you could bring to someone’s house for a potluck and everyone would fall in love. So easy and so good! 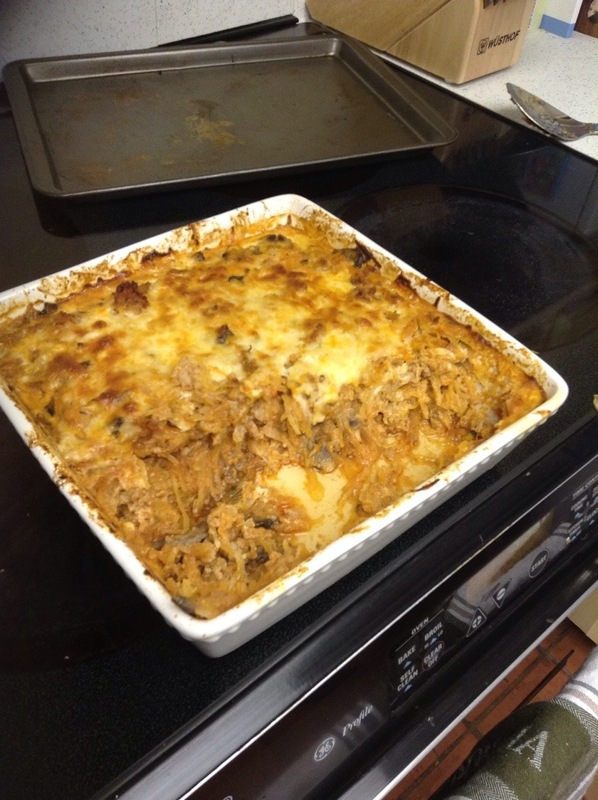 Found this recipe on PaleOmg and just tweeted a few things. 1. Cut your squash in half and bake at 400 for about 30-40 mins. I drizzle a little olive oil on top and set the squash halves face down. 2. Right before your squash is done cook the rest of the ingredients. Cook your sausage until no longer pink then add your onions, mushrooms, and seasonings. When this is all cooked down mix in the cup of pizza sauce and combine. 3. Take your spaghetti squash and rake it with 2 forks so you get all the little spaghetti pieces out of the squash and transfer to an 8×8 baking dish. 4. Combine the sausage mixture with the squash and mix together. 5. When that is completely mixed, add the beaten eggs and mis until you can no longer see any of the egg. Cool a bit and chow down! Not so much a new recipe as an awesome combo of two I have recently made. 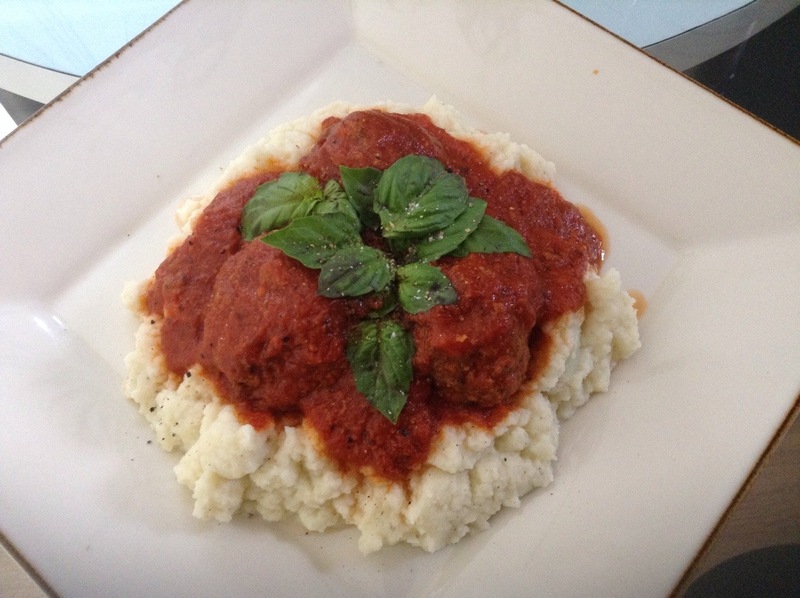 Just take the meatballs and sauce we made the other day, pair it with some mashed cauliflower- top with some fresh basil and BAM delicious leftover meal! I just discovered larabars. Like last week. Where on earth have I been? They are great! The ones I liked the most were the cashew date and the apple pie. 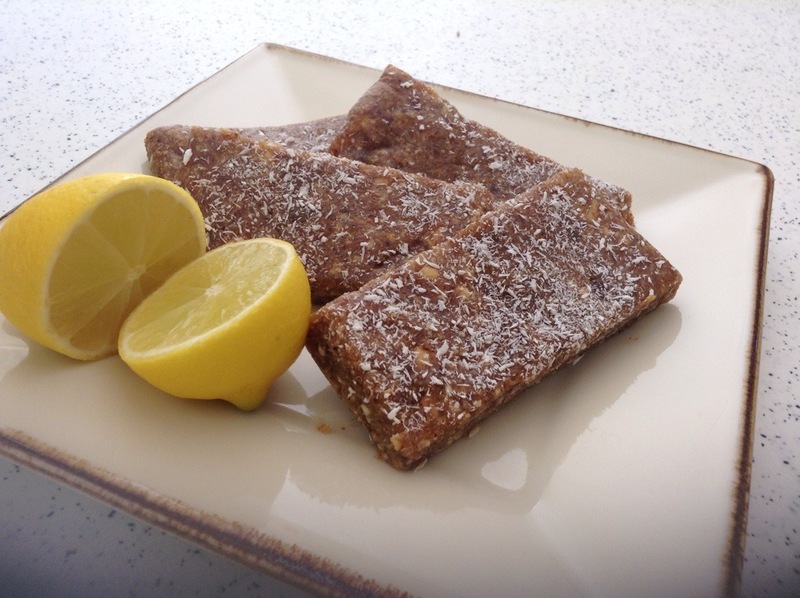 So this recipe is more along the lines of the cashew one, but just add dried apples and they would would be your apple/date bars. I’ll try that next batch. Ingredients are simple. I got this off a site called ‘bites for babies’. Go figure. I’m making baby food. I just added and took away a few things from hers like honey. I don’t know why you would want to add a sweetener to these, the dates make them plenty sweet enough! Joe loved them and he is usually my seal of approval. Said they tasted like lemon meringue. 1. 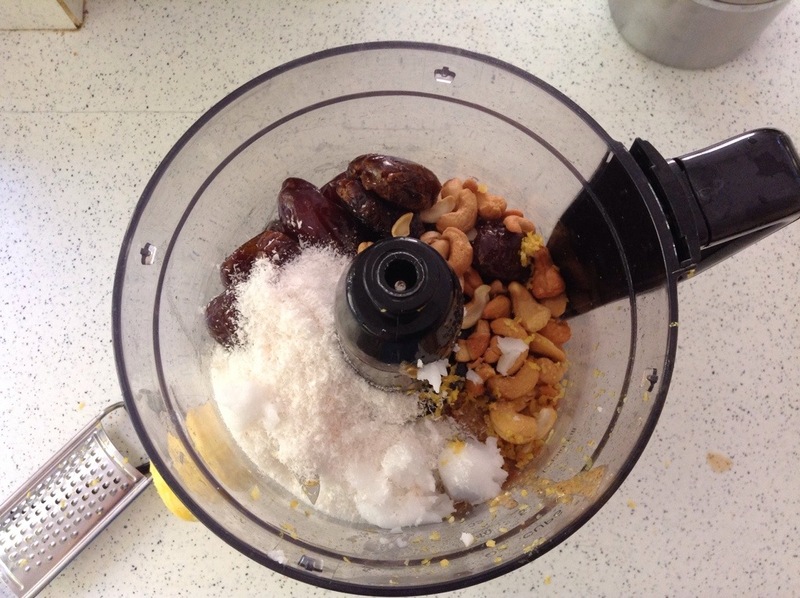 Add all ingredients to your food processor and blend away! 2. 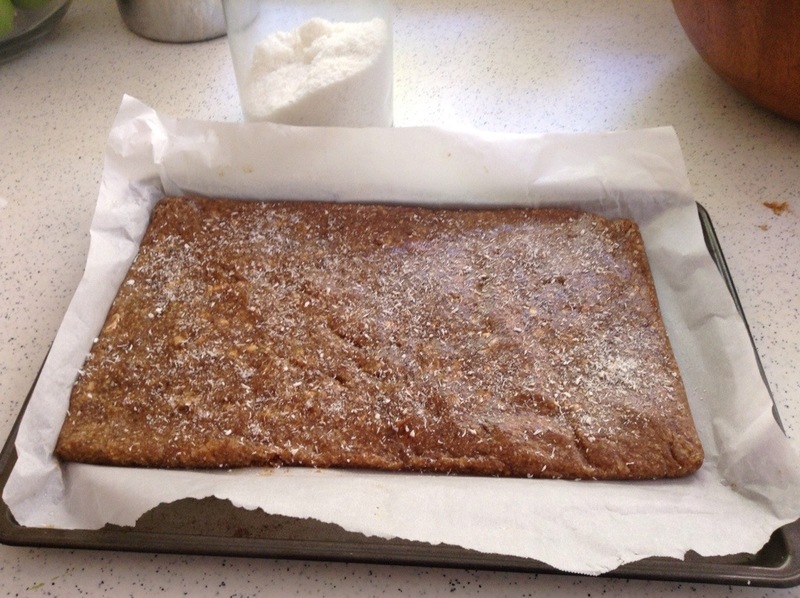 One you have your desired consistency transfer to a baking pan lined with parchment paper. Smooth the ingredients so they are about 1/2 inch high. You can make it nice and even by pressing it down with an extra piece of parchment paper, also rolling the sides up. 3. Refrigerate about 2-3 hours until they are hard enough to cut into pieces. Wrap each one up in Saran Wrap and keep in the fridge until you have a sweet tooth or need a little burst of an energy bar! I realize these shouldn’t be eaten everyday and in case of emergencies… But I like to have something on hand in my house in case this is something I NEED! Even half a bar is pretty satisfying. 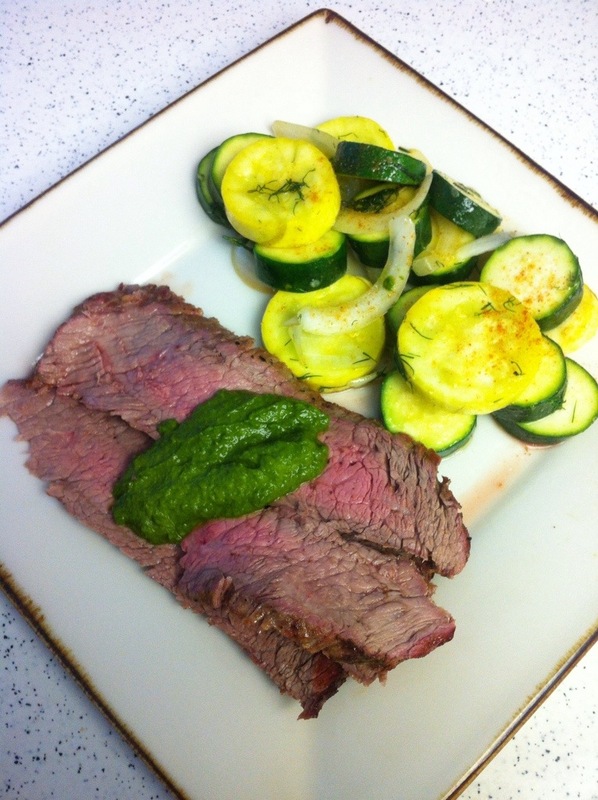 Joe actually found this recipe and it wasn’t very difficult to change to become paleo. I am pretty sure you aren’t supposed to have almond flour in Whole 30, so if you are super strict with that program- leave it out! I am pretty sure the meatballs will still stick together with all the seasonings, eggs, and onions. If you do try it that way, leave me a comment so I know if it works! 1. I generally try to buy organic and grass fed- but as you all know grass fed beef can get really expensive! For this dish- BUY GRASS FED ORGANIC GROUND BEEF! You are simmering these meatballs in sauce for hours and hours and when you are finished you will see a little bit of grease at the top. But I could tell how little there was and it actually looked like it added flavor then a ton of fat. If you used regular ol’ ground beef the amount of fat might be kinda gross. 2. 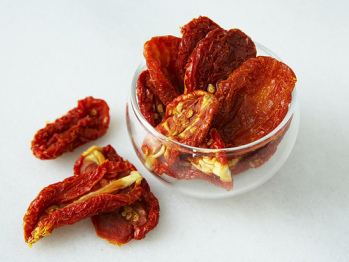 This recipe calls for tomato sauce, tomato puree, and crushed tomatoes. You NEED to make sure the ones you buy the only ingredients are tomatoes. There are tons of tomato sauces out there that add sugar. You may see sugar in the food label- but you can’t have sugar as part of the ingredients. Good to look for the ones just in the can and not the jars. They may seem really plain in flavor, but the spices in the meatballs season the sauce. Okay, here we go! I did this in the morning probably around 10am and we ate around 6pm. So make these so you have at least 6-8 hours for them to cook in the crockpot. * 5-6 large zucchini’s spiraled. 1. 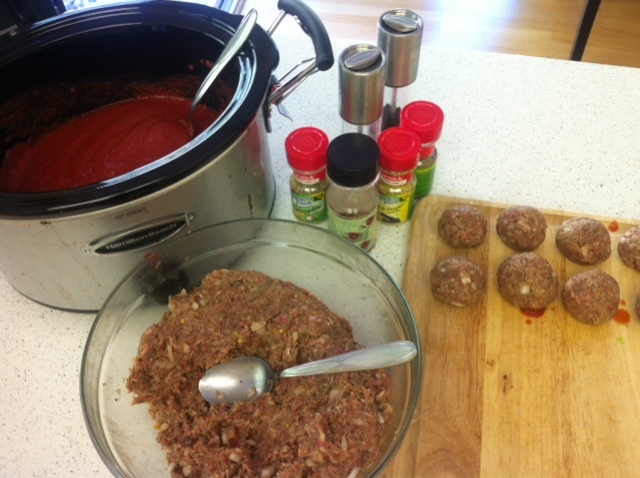 For the meatballs get a large mixing bowl add your minced onion, garlic, and beaten eggs. Once that is mixed in completely add all of the spices and the olive oil. I put a few tablespoons in at a time and mixed it up with my hands. (Ladies, remember to take your wedding ring off. I still think I have ground beef stuck under the diamond). 2. Once that is all mixed together and all the ingredients are incorporated evenly through the meat- add the almond meal until fully combined. 3. Add the tomato sauce, tomato puree, and crushed tomatoes to the crock pot and stir until combined. * 5-6 Green Zuchinni’s. 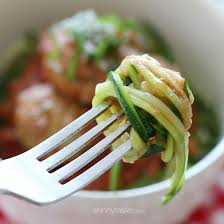 I would use a spiralizer so they have a noodle type of look to them. Think about 1-2 zucchini’s per person. 1. Cook them in boiling water no more then 3-5 minutes. You want these to be ‘al dente’. Otherwise they will be mushy and soggy and you will be really annoyed. I did that once, and yes… I was really annoyed. 2. 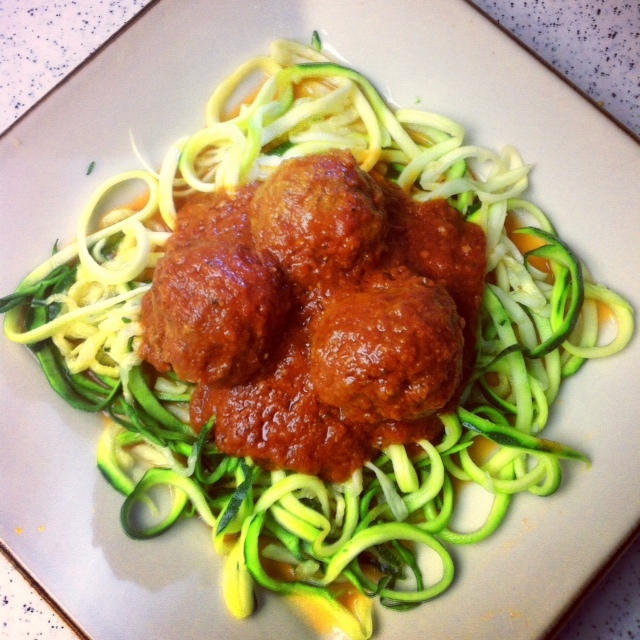 Drain the zoodles and serve on a plate with a heaping of the sauce and as many meatballs as you wish! Well the star of this dish is definitely the sauce. 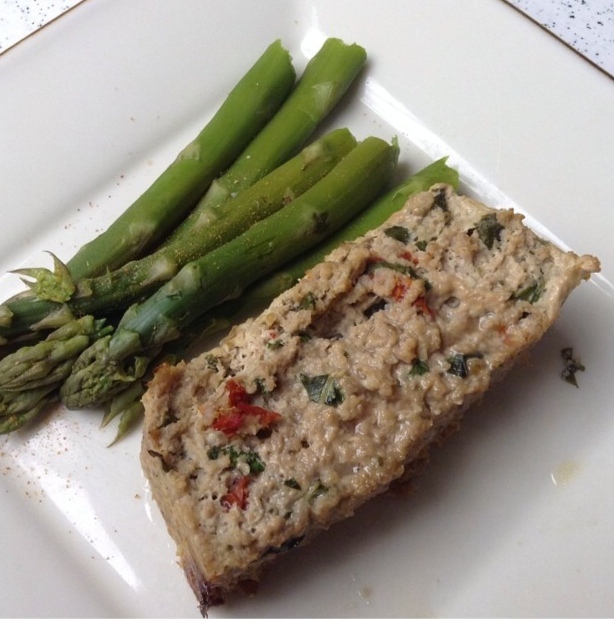 You can pretty much have some dry, boring, plain meat- throw this on and it kicks it into life! 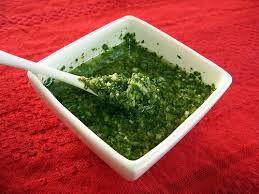 Also, this sauce really doesn’t need a whole lot of exact measurements so just throw as much greens in as you like, it will taste delicious. 2. Put all the remaining ingredients into a Nutribullet or some kind of a chopper that can get fresh herbs grinded down to a nice smooth texture. 3. I love having my favorite veggie dish with it- zucchini, yellow squash, white onion, and dill. Sauté for a few minutes and serve with! Cut your steak and put tons of the sauce on it. Delish! A nice staple to add to the list of whole 30/paleo dinners! Super easy and quick to make. Could have used a little bit more salt, so I will add that to the recipe. We also used a bit of ‘slap yo mama’ seasoning which gives it a perfect kick! 3. Put all of ingredients into one breadpan and cook for at least 45 mins. 4. Make sure there is no pink in the middle! 5. Serve and eat with your favorite fresh veggie! I am back! Day 1 of Whole 30 this time. I have been slacking on just about everything these past 6 months so it feels good to make a winning meal on Day 1. We now have wedding countdown at about 105 days so it’s time to get back in action! 1. Mix up all the ingredients (besides chicken & onion) in a bowl as the marinade. After you cut the chicken into cubes, place into the marinade and put into the fridge for at least 6-7 hours. It’s a super quick mix- so you can do this in the morning or night before and pull out when you are ready to thread your chicken. 2. 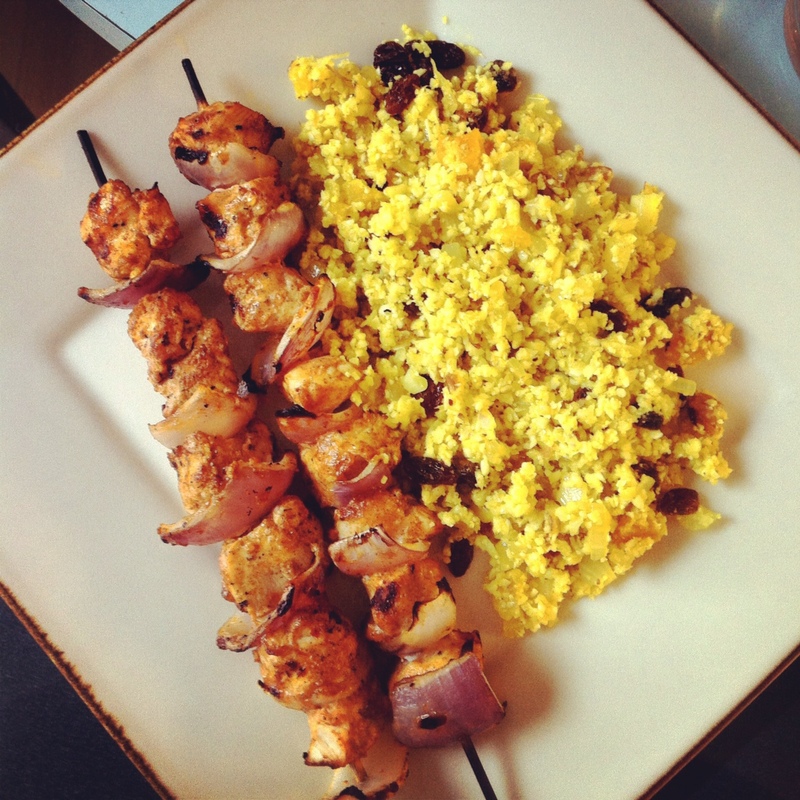 Cut the red onion into bite sized pieces and thread the chicken alternating with red onion onto skewers. 1. Heat Ghee in a large pan. Add onions and cook until transparent. Add garlic and spices and cook until fragrant- about 1 minute. 2. Add cauliflower rice and stir fry about 3-5 minutes. 3. Stir in fruit and nuts and toss until entire dish is heated.